The Movember Foundation is a non-for-profit organisation tackling men’s health on a global scale, year round. Funds raised go towards men’s health projects focusing on prostate cancer, testicular cancer, mental health and suicide prevention, with one key goal: to stop men dying too young. 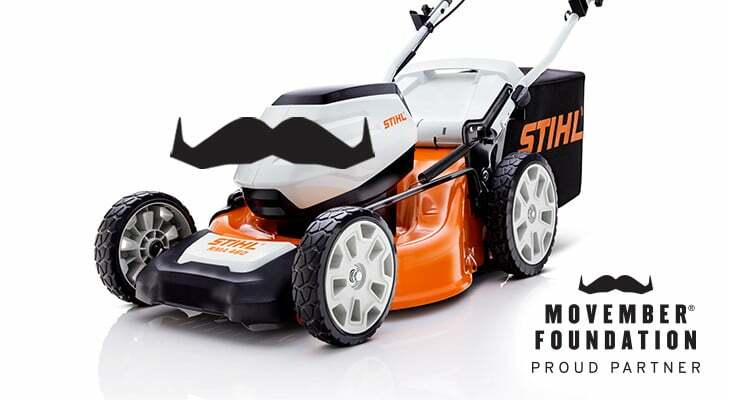 At STIHL, we see enormous value and importance in the work that the Movember Foundation does, that’s why we have proudly established an enduring partnership with them which we have launched with our Mow-vember campaign, featuring our new partnership with the Movember Foundation and our state of the art Battery Lawn Mowers. We want to help raise awareness and encourage as many people as possible to grow and mow this November to support the Movember Foundation and this worthy cause. The money that Movember raises goes directly to funding research to help cure those illnesses and improve survival rates. Our STIHL Dealer Network and customers are predominantly male. Foot traffic in Dealers is high and we want to break down the stigma of talking about men’s health, that’s why we are calling all STIHL staff, our Dealer Network and the wider STIHL community to get on board, and have some fun along the way. One in eight men will be diagnosed with prostate cancer before the age of 75. Testicular cancer is the most common cancer in young Australian men. Globally every minute a man dies by suicide. Six out of 10 suicides are men. Too many men are toughing it out and struggling alone. Causes of premature death can be prevented if identified and treated early, and action is taken to restore mental health and well-being by rallying the support of their friends, family and community during tough times. Movember raises awareness of those health issues, because men’s historical reluctance to talk about them is a big contributor to the rate at which they’re currently killing men all around the world – men who naturally include our fathers, sons, brothers, husbands and partners. STIHL is a family-owned and operated business, as is our network of STIHL Dealers and we see the importance of creating an environment where men feel comfortable to talk to other men and their families and friends about health issues. The garden is a great way to get some headspace where you are able to stick your head over the fence and start a conversation with your neighbour, or simply offer to mow your neighbour’s lawn. A gesture as small as saying ‘hello’ can lead to saving a life. This is why reaching out is crucial. 70% of men say their friends can rely on them for support, but only 48% say they would rely on their friends. This is an alarming statistic. Reigniting the conversation and reducing stigma around asking for help is one of the reasons we have decided to partner with Movember to raise awareness for men’s health. Our new partnership with the Movember Foundation hopes to not only raise awareness of men’s health issues, but to raise funds for the many initiatives the Movember Foundation support. Whether you grow a mo, move for men’s health, or host a moment by gathering mates – you have the power to stop men dying too young. Visit our store during the month of November to view our new range of Battery Lawn Mowers to help you Grow & Mow this Mow-vember. The prize will be drawn and the winner announced on our Facebook page on the 3/12/18 after 1:00pm.